The scorching summer heat is in full blast, in many parts of India. Thankfully, Bangalore weather is so pleasant with cloudy evenings and mild drizzle. Summer means many things - summer vacation, travel, mangoes, watermelons, tender coconut water, popsicles and of course, ice-creams. Apart from a few exceptions (including myself), most people LOVE ice-creams. My daughter is CRAZY about ice creams and given a chance, she would love to relish one every single day. I try to take her to “Naturals” ice-cream parlour now and then, as I find their ice creams to have a natural fruit-based flavour without any artificial taste. But some days, she insists on buying packaged/branded ice-cream from supermarkets. A few days back, she wanted Magnum’s chocolate “stick ice-cream”. She gave me a strict order NOT to take pictures or write about ice-creams ;-) But I couldn’t stop myself from reading the ingredients. The “classic” flavour with a 70 gm serving size has 19.2 gms OR close to 5 tsp of sugar. I had earlier shared about sugar allowance for kids in a day. If you haven't read it, please take a couple of minutes to go through it. The maximum added sugar that a child can have is around 5-6 tsp per day. Just one ice-cream stick is sufficient to hit their daily allowance limit. Let's look at the next big concern - "saturated fats" from unhealthy oils. The “classic” flavour with a 70 gm serving size has 9g of saturated fat. According to U.S. Department of Health and Human Services, no more than 10 percent of your child's daily calories should come from saturated fat, regardless of age or gender. In a 1,300-calorie diet, that's 14 or fewer grams of saturated fat. 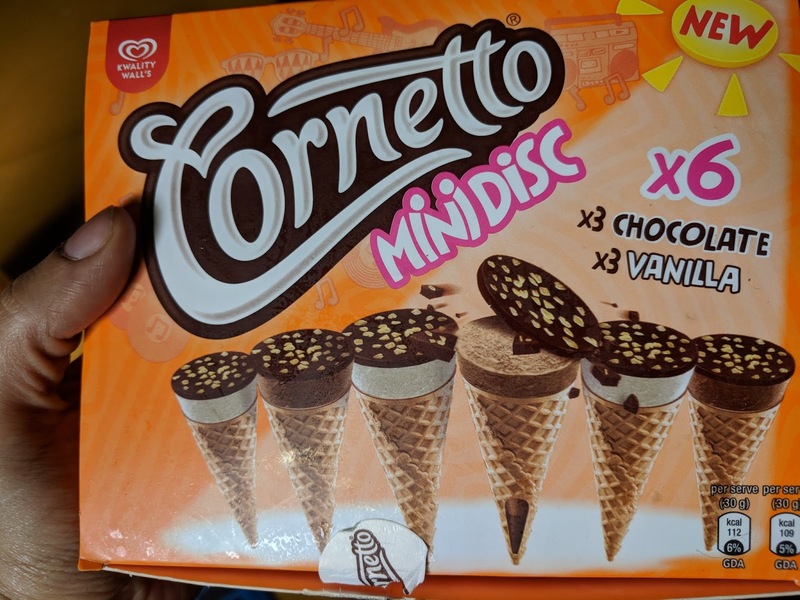 Let's also look at Kwality Wall’s Cornetto Mini Disc, which had 6 small cones of vanilla and chocolate flavours. For a serving size of 30 gm, each cone has 9g (OR close to 2.5 tsp) of sugar and 4.1g of saturated fat. More than the sugar, the synthetic additive numbers are a big concern to me. Why does a chocolate flavor need SO MANY synthetic food colours? I'm sure the ingredients list will look almost the same for the branded ones like Baskin & Robbins, ibaco etc. I wish they share the ingredients list of each flavor in their menu card. It is hard to say No to a child who loves ice-creams. It is okay to indulge once in a while, but let's keep in mind - given the number of options of packaged foods, if we adopt the "once-in-a-while" strategy for each of them, the overall consumption would still be very high. P.S. 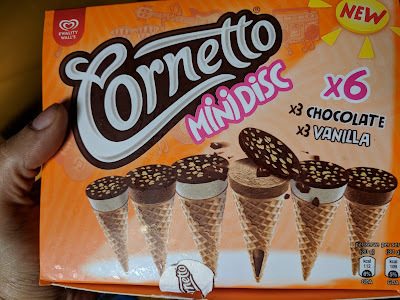 While checking out the pack of Cornetto ice-creams, a marketing person who was standing there in the supermarket wanted to take a picture of me and daughter buying this pack. I politely declined. But I couldn't stop myself from laughing at the irony! "dei, ennayum unga social media ko.pa.se vaa aakka paakringala?" :-) ("Are you trying to use me as your social media spokesperson?) Naa, not the same effect in English! !